Trina and I had such a Fab time at the Hobbycraft Show and meeting Crafty Bob was one of the highlights of the day... I think Crafty Bob could tell that I was a bit star struck and that's why I got the extra BIG HUG! This page was inspired by the Simple Recipe for July at UKScrappers. 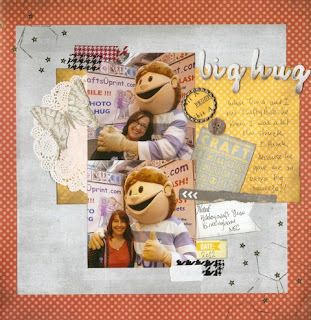 This month, Leo from Quirky Kits challenged us to use 3 colours - Rusty Red, Happy Yellow and Cloudy Grey. We were also to use Washi Tape, Sequins and something from our kitchen cupboards! I loved working with this colour combo and I've managed to include all the other elements. Here's a bottle cap (squished in my Cuttlebug and finished with a stamped paper scrap) which almost counts as a kitchen item. You can also the edge of a free printable bingo card from Scrap365 and the Amy Tangerine alphas which I inked for contrast against the yellow. 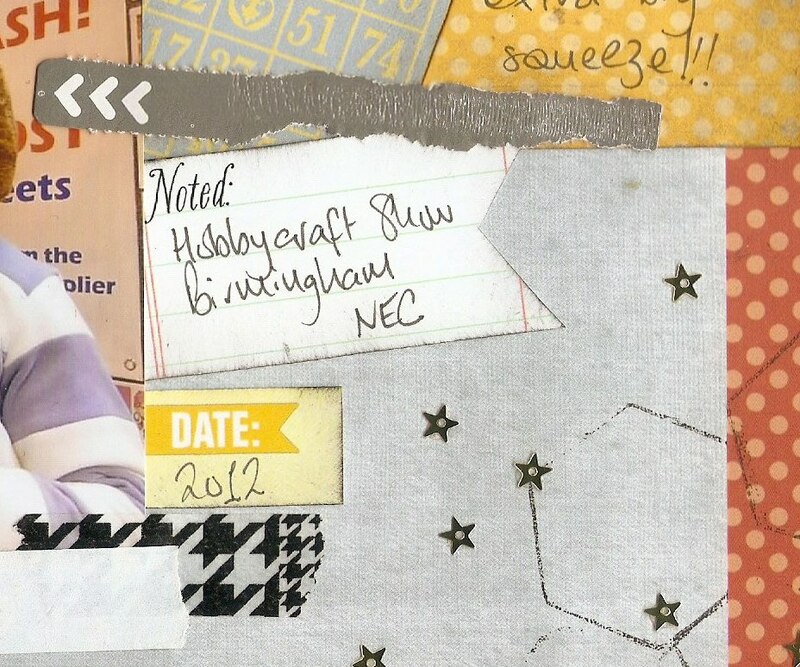 Here you can see the golden star sequins (which fit right in to my story), some of the washi tape and a couple more kitchen items - the strip torn from a DVD envelope which I dug out of the recycling bag and the hexagons which were printed using a cocktail stick pot as a stamp. 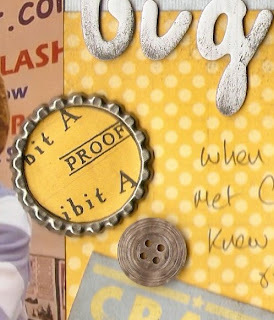 You may have noticed that I am STILL using up stuff from my Quirky Kit and the next one is due any time - can't wait to get my hands on it!